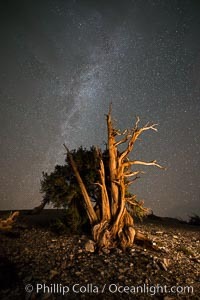 Stars and the Milky Way rise above ancient bristlecone pine trees, in the White Mountains at an elevation of 10,000' above sea level. These are some of the oldest trees in the world, reaching 4000 years in age. Schulman Grove Photo. Ancient bristlecone pine tree, rising above the arid, dolomite-rich slopes of the Schulman Grove in the White Mountains at an elevation of 9500 above sea level, along the Methuselah Walk. 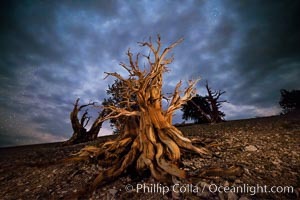 The oldest bristlecone pines in the world are found in the Schulman Grove, some of them over 4700 years old. Ancient Bristlecone Pine Forest. Schulman Grove Picture. 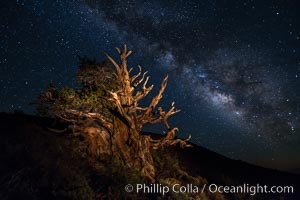 Ancient Bristlecone Pine Tree at night, stars and the Milky Way galaxy visible in the evening sky, near Patriarch Grove. Stock Photography of Schulman Grove. 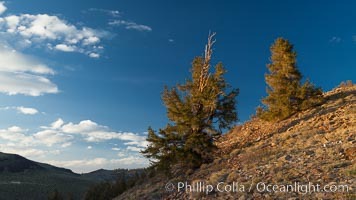 Ancient Bristlecone Pine Tree at sunset, panorama, with storm clouds passing over the White Mountains. The eastern Sierra Nevada is just visible in the distance. Photograph of Schulman Grove. 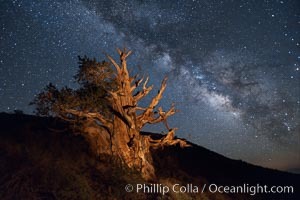 Ancient Bristlecone Pine Tree at night, stars and the Milky Way galaxy visible in the evening sky, near Patriarch Grove. Schulman Grove Photos. 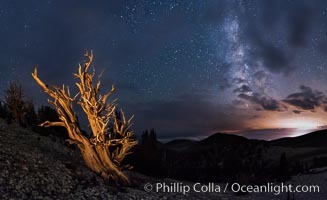 Stars and the Milky Way rise above ancient bristlecone pine trees, in the White Mountains at an elevation of 10,000' above sea level. These are some of the oldest trees in the world, reaching 4000 years in age. Schulman Grove Image. 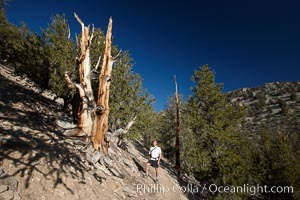 A hiker admires an ancient bristlecone pine tree, on the Methuselah Walk in the Schulman Grove in the White Mountains at an elevation of 9500 above sea level. 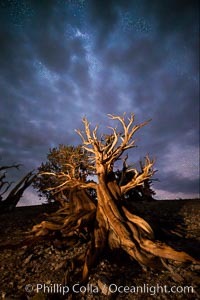 The oldest bristlecone pines in the world are found in the Schulman Grove, some of them over 4700 years old. 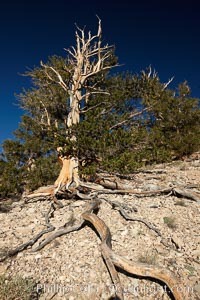 Ancient Bristlecone Pine Forest. Professional stock photos of Schulman Grove. Stars and the Milky Way rise above ancient bristlecone pine trees, in the White Mountains at an elevation of 10,000' above sea level. 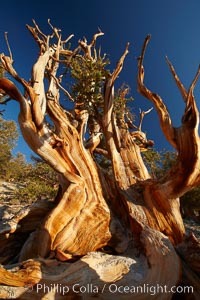 These are some of the oldest trees in the world, reaching 4000 years in age. Pictures of Schulman Grove. 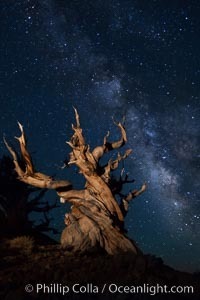 Stars and the Milky Way rise above ancient bristlecone pine trees, in the White Mountains at an elevation of 10,000' above sea level. These are some of the oldest trees in the world, reaching 4000 years in age. Schulman Grove Picture. 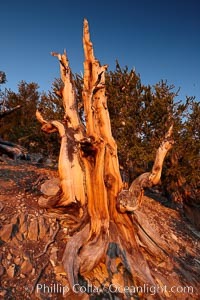 Ancient bristlecone pine tree, roots spread wide and exposed over dolomite-rich soil, rising above the arid slopes of the Schulman Grove in the White Mountains at an elevation of 9500 above sea level, along the Methuselah Walk. 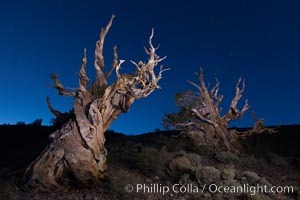 The oldest bristlecone pines in the world are found in the Schulman Grove, some of them over 4700 years old. Ancient Bristlecone Pine Forest. Stock Photography of Schulman Grove. 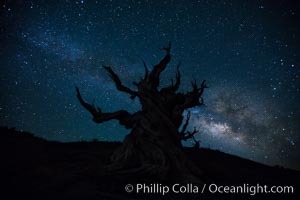 Ancient Bristlecone Pine Tree at night, stars and the Milky Way galaxy visible in the evening sky, near Patriarch Grove. Photograph of Schulman Grove. Stars and the Milky Way rise above ancient bristlecone pine trees, in the White Mountains at an elevation of 10,000' above sea level. These are some of the oldest trees in the world, reaching 4000 years in age. Schulman Grove Photos. 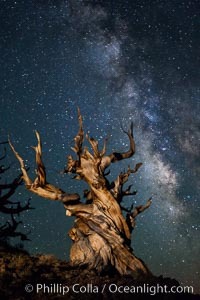 Stars and the Milky Way rise above ancient bristlecone pine trees, in the White Mountains at an elevation of 10,000' above sea level. These are some of the oldest trees in the world, reaching 4000 years in age. Professional stock photos of Schulman Grove. 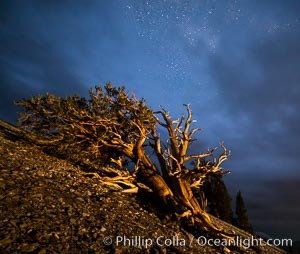 Stars trails above ancient bristlecone pine trees, in the White Mountains at an elevation of 10,000' above sea level. These are some of the oldest trees in the world, reaching 4000 years in age. Pictures of Schulman Grove. Ancient bristlecone pine tree, rising above the arid, dolomite-rich slopes of the Schulman Grove in the White Mountains at an elevation of 9500 above sea level, along the Methuselah Walk. 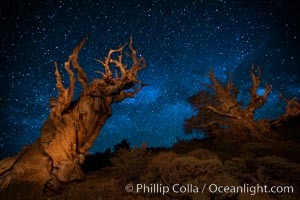 The oldest bristlecone pines in the world are found in the Schulman Grove, some of them over 4700 years old. 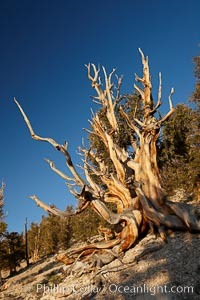 Ancient Bristlecone Pine Forest. Schulman Grove Photo. Ancient bristlecone pine tree, rising above the arid, dolomite-rich slopes of the Schulman Grove in the White Mountains at an elevation of 9500 above sea level, along the Methuselah Walk. 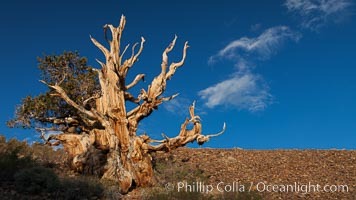 The oldest bristlecone pines in the world are found in the Schulman Grove, some of them over 4700 years old. Ancient Bristlecone Pine Forest. Stock Photography of Schulman Grove. 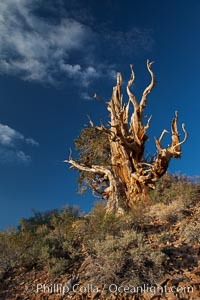 Ancient bristlecone pine tree, rising above the arid, dolomite-rich slopes of the Schulman Grove in the White Mountains at an elevation of 9500 above sea level, along the Methuselah Walk. 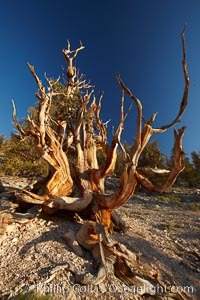 The oldest bristlecone pines in the world are found in the Schulman Grove, some of them over 4700 years old. Ancient Bristlecone Pine Forest. Photograph of Schulman Grove. Ancient bristlecone pine tree, rising above the arid, dolomite-rich slopes of the Schulman Grove in the White Mountains at an elevation of 9500 above sea level, along the Methuselah Walk. 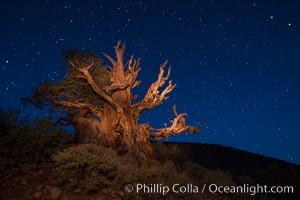 The oldest bristlecone pines in the world are found in the Schulman Grove, some of them over 4700 years old. Ancient Bristlecone Pine Forest. Schulman Grove Photos. 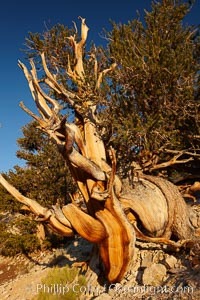 Ancient bristlecone pine tree in the White Mountains, at an elevation of 10,000' above sea level. These are some of the oldest trees in the world, reaching 4000 years in age. Professional stock photos of Schulman Grove. 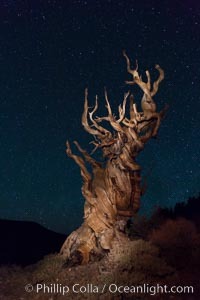 Ancient bristlecone pine tree in the White Mountains, at an elevation of 10,000' above sea level. These are some of the oldest trees in the world, reaching 4000 years in age. Pictures of Schulman Grove. Ancient bristlecone pine trees in the White Mountains, at an elevation of 10,000' above sea level. These are some of the oldest trees in the world, reaching 4000 years in age. Schulman Grove Photo. 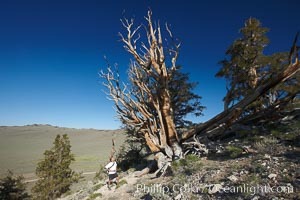 A hiker admires an ancient bristlecone pine tree, on the Methuselah Walk in the Schulman Grove in the White Mountains at an elevation of 9500 above sea level. 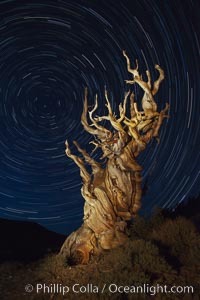 The oldest bristlecone pines in the world are found in the Schulman Grove, some of them over 4700 years old. 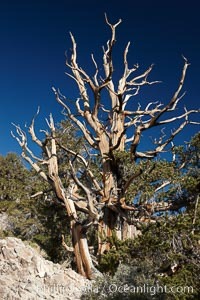 Ancient Bristlecone Pine Forest. Stock Photography of Schulman Grove. 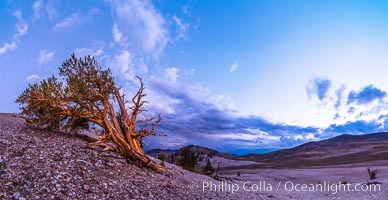 Ancient Bristlecone Pine Tree at sunset, panorama, with storm clouds passing over the White Mountains. The eastern Sierra Nevada is just visible in the distance. Schulman Grove Photos. 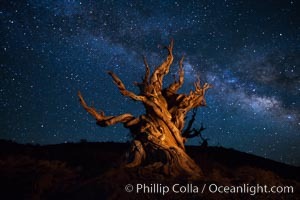 Ancient Bristlecone Pine Tree at night, stars and the Milky Way galaxy visible in the evening sky, near Patriarch Grove. Schulman Grove Image.